On April 5, the annual and much lauded World’s 50 Best Restaurants list was released. Decided by an Academy of around 1,500 members, made up of chefs, food critics, restaurateurs, and more, the list serves as a manual for famous food names and places. Although controversial for its general lack of female chefs, Euro-centrism, etc., the list offers a glimpse into what might be considered the most cutting-edge, most refined, and most interesting dining to be had anywhere in the world in 2017. What tea do they serve? Before we dive into the list, a few notes: I decided to only look at the top 10 restaurants on the list, since investigating 50 would be a near Herculean task, and frankly, after a list of 10 you tend to get the gist. I’ve also decided to highlight features of the menus when tea, or even the idea of tea, was used in a novel way, even if it wasn’t strictly tea to drink. I highly encourage you to look into these restaurants yourselves, and if you’ve visited, to share your experience with us! There’s an amazing, beautiful, fascinating culinary world to discover. Now to the list! The famous American tasting kitchen has secured the top spot this year. Headed by chef Daniel Humm and co-owned by him and Will Guidara, the elegant spot in New York City tends to favor ingredients with a New England flair and accent. It may come as a shock, or again perhaps not, that the tea service at Eleven Madison Park is the best on this entire list. A good friend of mine eats here every year, and every year I hear more stories of just how incredible this place is. It goes beyond the simple flavor and exoticism of the food to being more a contemplation of the idea of service and crafting an unforgettable sensory experience for the diner. They give you wrapped gifts and souvenirs, they perform magic tricks at the table which determine certain courses you’ll have, and they’ve been known to simply leave a bottle of apple brandy for you to have as much as you want. Playfully, teaware has been incorporated into dishes as well, such as in their Clambake. Savory teas have made appearances as a sort of palate cleanser too, like Tomato Tea with Lemon Thyme. Eleven Madison Park is notable in the tea community for having made waves a few years back when one of their dining room managers, Chris Day, trained as a tea sommelier and introduced a rigorous and modern tea program. His methodical approach to sourcing and service embodies a concept within the restaurant referred to as “individual attention”. That is, if there’s a dining or service concept the staff would like to explore, they can devote this individual attention to it and refine it to a degree where it can be used in the restaurant. Apparently, this is what Chris Day did and the tea quality and service are still the best on this list. To serve tea to customers, a server must be thoroughly trained and have reached a certain rank. It seems matcha is an option for table side preparation, but the real treat is in the gongfu preparation. Using entirely custom made teaware (all the service ware in the restaurant is custom made), a server heats the water on a small gas burner while explaining the tea’s origin, flavor, processing, etc. Then, they measure out the tea and methodically stack multiple steepings of the tea into separate cups, so that you may enjoy the evolving flavor of the leaves. They don’t typically have many teas to chose from, but what they do have is always very high quality, usually sourced from In Pursuit of Tea or from consultants like Kathy YL Chan. These range from a Shan Lin Xi Gui Fei, to a 16-year aged Tie Guan Yin from Anxi, to a $65 a pot A’a Hawai’ian black tea, to a 30-year-old pu’er aged in a bamboo shoot (a personal favorite of the chef). Headed by exuberant chef Massimo Bottura, and featured in the very first episode of Netflix’s original series Chef’s Table, this restaurant takes traditional Italian cuisine and purposefully flips it on its head with whimsy and artistry. The dishes play with names and concepts and memory, such as one of their famous desserts, titled Oops! I Dropped the Lemon Tart, and one of their first groundbreaking dishes, An Eel Swimming Up the Po River. Bottura is no stranger to tea; I read a story about him marinating a fish in white tea when they were out of wine, and found a few desserts using matcha, such as Green tea madeleines. There was also a dish that seemed to be a scallion and thinly sliced truffle broth served in a gaiwan. But although it seems very unlikely that they wouldn’t have some tea at this restaurant, I could find no direct evidence of it. They do use Lavazza coffee, who happens to be a sponsor of the 50 Best Restaurant list. The Holy Trinity of superstar chefs reside here, the Roca Brothers: Joan as head chef, Jordi as head pâtissier, and Josep as head sommelier. Each brings their own unique presence to the restaurant and you can bet all three categories excel in every aspect. Joan creates dishes such as Steak Tartare with Mustard Ice Cream. Jordi bases certain desserts off aromas and creates dishes such as Chocolate Anarchy. And Josep has a walk-in wine cellar where he invites diners to experience wine his way and behold his extensive wine list. Sea bream with capers and yuzu. Unbelievably (or perhaps, it’s totally believable? ), this restaurant has the most extensive tea menu of any on this list, at 47 tea options! There are some highlights, such as a 1980 aged pu’er and a clonal tea from Singbulli in Darjeeling. 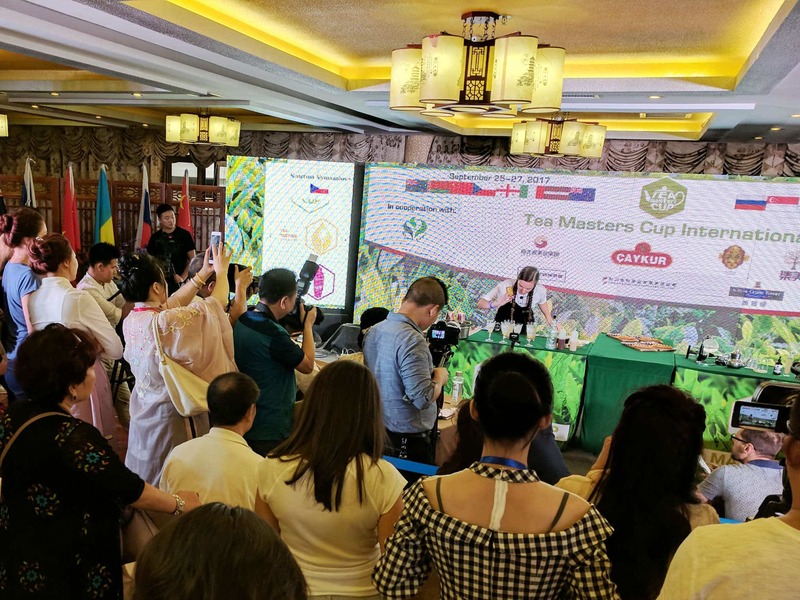 But it seems the same kind of attention was not paid to this list, and it ends up with vague names such as “Super Fancy Oolong” and simply “Assam”. Still, they did have a diversity of teas from Japan, Korea, India, Sri Lanka, Taiwan, and China. The teas are brewed in a cast iron teapot, served with both the dry and steeped leaf on display beside it. Tea would run you 5, 7, and 9 Euros depending on rarity (about the same in USD). The refined, beach-side restaurant on the Cote D’Azur headed by the Argentinian-born Mauro Colagreco features some of the freshest seafood and produce from the region. I’ve read that there was originally a tea room in their restaurant for some time, but the details on this are vague. They do offer matcha as a meal finisher and serve certain teas in cast iron teapots. Also, loose leaf tea steeped in glass mugs are available table side with rock sugar. Matcha has also been incorporated into desserts, such as a Green tea and white chocolate “pill” and Matcha macarons. Headed by the enigmatic chef Virgilio Martinez and his wife Pia León, this restaurant was also featured in Chef’s Table. The menu is unique in its approach of creating miniature biomes in their dishes, identifying the unique terroirs with specific altitudes. Their relationship with food and the earth from which it comes verges on spiritual. A unique addition to the list, being a restaurant that specializes primarily in grilling, headed by Victor Arguinzoniz. It doesn’t get much more rustic or simple than this; primarily relying upon the freshness of the ingredients and the skill of the cooks, the simplicity doesn’t extend to tea… I can find no evidence of tea whatsoever at this restaurant. It does look like they have coffee though. The famous nouveau-Indian restaurant in Bangkok created by Gaggan Anand, also highlighted on Chef’s Table, reflects its namesake chef’s high energy and creativity: the menu initially given to diners is comprised of emojis. rice paper bag on top of a cup, meant to be eaten whole. They’ve also served at one point black tea ice cream with crushed gingerbread and cardamom gel. The real scene stealer is what they call Red Matcha. A waiter serves a bowl of fruit carved into shapes meant to emulate wagashi, or Japanese sweets typically served during chanoyu (the Japanese Tea Ceremony). Then, they take a chawan (tea bowl) and add a red powder. Using a chasen (tea whisk), they whisk in a red broth poured from a tetsubin (cast iron teapot). The powder and broth are both made not with tea, but with tomato. Japanese cuisine fused with Peruvian food serves as the foundation for this restaurant, much like the head chef himself, Mitsuharu ‘Micha’ Tsumura, who is Peruvian-born but of Japanese heritage. Bizarrely, especially for a place that relies so heavily on Japanese influence, I can find no evidence of a tea menu or even tea being served at this restaurant. There is occasional mention of something called cushuro, which is served in a Treasures themed dessert, has a gelatinous texture, and tastes like earl grey. What is it? It’s an Andean highland lake bacteria. Not tea. What many see as the natural successor to the legendary El Bulli, Andoni LuisAduriz has created a restaurant described as “techno-emotional” Spanish cuisine with dishes such as loin of lamb smoked over eucalyptus and served with its cultivated wool. Tea seems to be incorporated into many of the dishes seen here: Homemade mozzarella and whey emulsion infused with smoked black tea, Jasmine and hay mochi, and Violet ice cream with hot almond marzipan and shavings of spiced bread with green tea. Matcha was also used in a few dishes. A refreshing feature of the service is a limited option of beverages during the meal: so as not to kill the flavor of the dishes, you can choose between sake, champagne, or tea. Their tea program seems to be on track with other upscale restaurants, offering a tea box of different varieties to select from, all tobe steeped in a small glass teapot wth glass infuser. I’ve seen a classic masala chai and genmaicha being served and based on the size of their tea box, I’m sure they have many more. Founded in traditional Austrian Styrian cuisine, but made modern by head chef Heinz Reitbauer, this restaurant has everything from classic Wiener Schnitzel to freshwater mountain fish cooked at the table in hot beeswax and served with yellow carrot, pollen, and sour cream. One of the main features here, something found in many other upscale European restaurants, is the plethora of food carts that are rolled to the table in service of the meal. They have an aperitif cart for libations, a bread cart with 30 different styles from around Vienna, a cheese cart with upwards of 55 different kinds of cheese, and finally, a tea cart. They have a selection of artisanal teas from around the world that they can brew for you, but will additionally create a custom blend of herbs and tea from the refreshing array of fresh garden plants grown on their rooftop! In researching the history of this particular cart, it seems they used to store their tea in glass jars and brew in a European-style porcelain teapot. Someone must’ve gotten wise (perhaps from reading our very own article) and they now store the teas in matte tea caddies and use a cast-iron teapot to brew.